“Why, sometimes I’ve believed as many as six impossible things before breakfast.” says the White Queen in Alice in Wonderland. 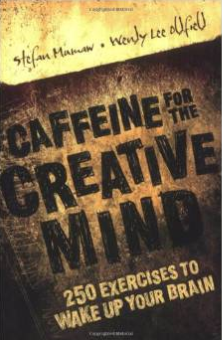 And pushing our brain into the realms of the impossible is just what “Caffeine for the Creative Mind” is all about. My pictogram for “Pressure” is shown left, which is the one I found easiest to imagine. Dangerous came out looking a lot like the symbol for mars and it’s pretty hard to distinguish between delirious and joyful when I draw them. But it struck me as a fun concept to remove writer’s block as well as waking up my brain. Some of the exercises involve building something, some are about writing, some are reminders of games once played in school (or at strange parties) such as Mad Libs. The book is sprinkled with interviews from some creative types; artists, writers, entrepreneurs offering wit and inspiration for those days where exercising your brain is just too much. It’s a good book, a rich source of fun challenges to wake up your brain. Now if only I could think of an animal with a number in its name.